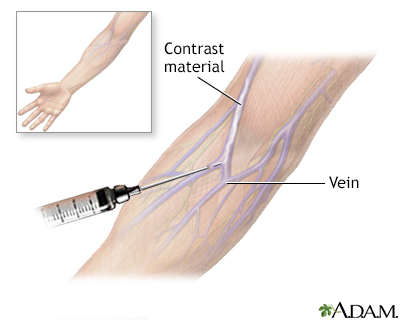 An intravenous pyelogram is performed by injecting contrast material into a vein in the arm. A series of x-rays are taken at timed intervals as the contrast material goes through the kidneys, the ureters (the tubes connecting the kidneys to the bladder), and the bladder. The procedure helps to evaluate the condition of the kidneys, ureters, and bladder.